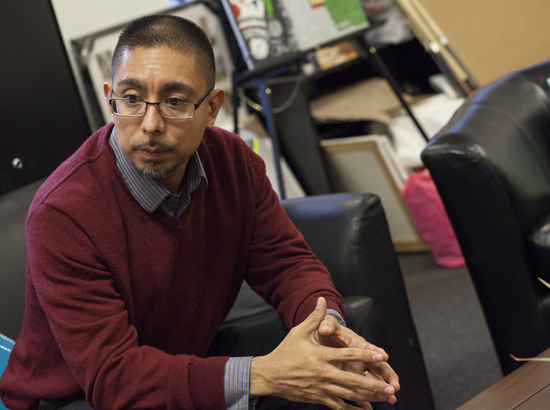 Eddie Bocanegra, co-executive director of the YMCA of Metropolitan Chicago’s Youth Safety and Violence Prevention initiative, plays a central role in the Y’s outreach efforts for at-risk youth. Featured in the 2011 documentary “The Interrupters” for his previous work with the anti-violence program CeaseFire, Bocanegra, a former gang member, is also a graduate student at the University of Chicago. The Reporter sat down with Bocanegra to discuss popular misconceptions about youth violence, his experiences with gangs and incarceration, and the need for policy reform. How did you wind up in a gang? There were two reasons why—which tend to be the common theme with a lot of our youth. The reality is that being part of a gang or even a group, right, what that tends to do for you is give you a voice, which it did for me. It gave me a voice, knowing that someone would not vandalize our car or vandalize our home and that nobody would pick on my little brothers or sisters because as a gang member I had a say, I had a vote. What did you gain when you left the gang, and what did you lose? There’s this misconception that kids join gangs just because they want to. The truth is that many of these kids join gangs because they have to. A lot of it is through peer pressure, but the other part is the pressure they feel through being ostracized by individuals or families because of differences they might have. I saw as a kid and I see it now with a lot of kids who are not necessarily meeting the standards of education in grammar school, where they might have issues learning because of language barriers, so then they tend feel excluded from certain things. That exclusion, gangs tend to capitalize on. … They find a place for you. What does the Y do to provide at-risk youth with the support they’re looking for? We have a program that we’re about to roll out called Urban Warriors, where it takes combat veteran soldiers mentoring at-risk youth who have scored high ACEs—ACEs meaning Adverse Childhood Experience—which tends to lead to PTSD (post-traumatic stress disorder). What do you say to these guys to persuade them to stay away from gangs? It’s being able to understand that this 14-year-old kid, despite the fact that he might have been arrested 20 times already, he’s still a 14-year-old kid. Sometimes our communities, especially outside of the poor communities, we tend to pretend that these problems are not ours and the other part is we disconnect ourselves, we don’t see the humanistic part of these kids. What do the media get wrong about youth violence? Not every homicide in Chicago is gang-related, man. Not every murder. Just because it’s a 16-year-old does not mean that it was gang-related. The kid might have been in a gang. That doesn’t mean the murder itself was gang-related. That’s another part the media totally gets wrong. And here’s another part: honestly, not every kid that gets shot is a CPS shooting, man. It constantly gets framed [as] another CPS shooting, another CPS student killed. Some of these kids are getting killed at 7, 8 o’clock at night. How does CPS come into play with this? Where does violence prevention fit into the big picture? It’s election season for many [politicians] and they keep chanting, we want safer communities. Well, s***, we all want safe communities. We all want to be able to walk out of our house and walk towards our car, into the store safely. But why is it that every time we talk about “tough on crime,” it keeps referring to the same communities, man? It keeps referring to the seven communities in Chicago that tend to receive more of the people that are returning back from prison – the Austin community, North Lawndale, Roseland, the Little Village communities. Why is that? Because when we create stricter policies, the only people who we continue to isolate or continue to marginalize or impact in a negative way are those communities right there. Recently [Gov. Quinn] signed off on this bill to eliminate check-the-box [for state jobs]. That, at the bare minimum, will allow individuals [to get a job] interview. I say that because I’ve applied for certain jobs, man—and not even an interview. When you’re not even being given that opportunity, then how can you actually advocate for yourself? That’s why I congratulate the governor on that, and I really applaud organizations and companies who are really giving, not just a second chance—for many people it’s a first chance of opportunity, man. Every Monday, we’ll talk to a different Chicagoan in TCR Talks.